This post presents a method that does not resort to using arrays, as the built-in methods do, but instead uses scala.collection.immutable.List itself. Finding myself writing Java code making heavy use of arrays, one minute, and then Scala code in which everything should be immutable, the next, I decided to try to rewrite some of the former in the manner of the latter. The code in question examines a set of 2-d points, and finds all those points which lie on hidden straight lines (with at least four points per line); the object of the exercise was to demonstrate a clever algorithm which employs sorting to reduce the time taken, so that it becomes proportional to N*log(N) rather than N*N (for N points). Having eventually succeeded in rewriting this in Scala, using immutable lists instead of arrays, I began to wonder how the sort method I was blithely calling was actually implemented. The answer is that the list is first copied to an array, which is then sorted (using one of Java's built-in sort methods), before being copied to a new immutable list. No wonder the immutable list version was taking longer than the array one, with all that copying going on. Why not do the sorting by creating new immutable lists directly? Searching the web, the best algorithm I could find was one for sorting mutable linked lists, with a sample implementation written in C. Therefore, using this one as a starting point, I began to devise one of my own, using Scala. This could easily have been one of the FPPinS assignments, but without the skeleton solution! After a great deal of perseverance, writing out of lists using pencil and paper, and an exercise in divining recursive functions from sets of similar ones, the following algorithm and implementation was arrived at. each element of the tail of that list is then merged with the head. Each subsequence in stage 1. is sorted by repeatedly considering it to be the concatenation of pairs of sorted subsequences, initially of length, 1, which are then merged. In this way, it was found possible to use only constant-time list-operations (head, tail, ::) throughout. 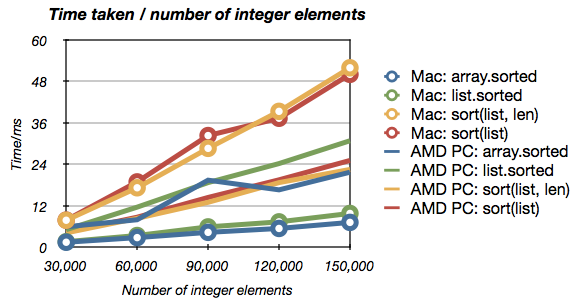 Note that the the number of subsequences may be derived from the number of elements using Java's Integer.bitCount method. The cases can be neatly implemented using case-classes, of a trait supplying a method that returns the order as a function of both the position of the subsequence and the previous order. If possible, the order of two elements considered equal by the sort criterion should be preserved (in case it might be significant), in which case the sorting algorithm is termed 'stable'. Here, stability was achieved by being more careful when selecting the particular inequality to test for when comparing elements. The implementation, complete with tests of performance as well as for correctness, is to be found in a GitHub project called list-sort. Performance testing was carried out using the rather useful ScalaMeter framework (which I learned of here). As shown in the figure, the answer to the above question soon became apparent - it takes about 7 times longer to sort an immutable list of 30,000 integers, compared with using the built-in sorted method (which first copies the elements to an array, and sorts that), falling to about 4 times longer for 150,000 integers. [2013-01-07 The above results were obtained on a dual-core MacBook Pro, using--as pointed out by Eugene Platonov (see comments)--input arrays/lists which were already sorted. So, new results have been obtained, this time using input arrays/lists in reverse-sorted order (thereby representing the worst case), and on two different set-ups (thanks to results submitted by Eugene in the comments). Given that it is possible to sort a list in just a few lines of code if the restriction to constant-time list operations is removed, at about 100 lines of code excluding doc-comments, this particular algorithm and implementation are relatively complex and lengthy. that the recursive function to sort the first (largest) power-of-2 elements is not tail-recursive. Note that this should not however (in itself) result in excessive use of memory, since only log2(len) frames will accumulate (which is only 17 in the largest test case). [2013-01-07 The new results show a significant difference in performance characteristics between the two set-ups. With Java 7 on a dual-core (Intel) Mac, the built-in sorting methods perform much better than the current algorithm, and this does not appear to be affected by whether or not the input is already sorted. A stable algorithm for sorting an immutable list, using only constant-time list-operations, was devised and implemented in Scala. okay provided access is controlled and interface is purely functional. [2013-01-07 The contributed results suggest that, on the contrary, using functional programming to sort a list can indeed be more efficient than using imperative arrays, depending on the particular set-up. Tysvm for taking the time to explore this space sp explicitly and then to document the details. Glad to hear it's appreciated. Writing things up also actually helps! Scalameter generators always produce same data and in your case they generate already sorted arrays and lists. SeqLike's sorted method uses java.util.Arrays.sort internally which takes advantage of already sorted arrays. [info] jvm-vendor: Sun Microsystems Inc.
Hm.. your results are quite a bit different, aren't they: the algorithm compares much more favourably on your machine! Btw, my results were obtained on a dual-core MacBook Pro (which I should have mentioned). And now the algorithm wins! Okay. But what if we just generate the array/list in reverse order (instead of randomising it) - surely the algorithm should win here as well? 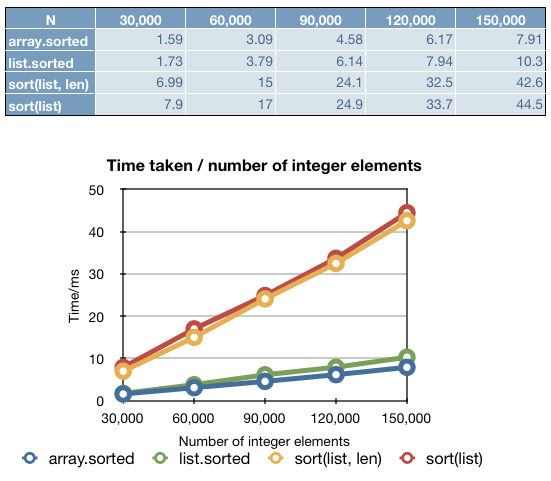 Compared with your first set (for a pre-sorted array/list), the times for array.sorted and list.sorted have indeed increased, so much so that the algorithm is actually on-par with array.sorted(!) and, more crucially, is faster than list.sorted, presumably on account of all that copying that list.sorted has to do! Entry just updated in light of these new results - thanks a lot, Eugene. Check this site mindmajix for indepth scala blogs. Go here if you’re looking for information on scala training. That’s really cool… . I followed these instructions and it was like boom… it worked well..
even I'm getting the same error while installing MS dynamics crm client on Informatica 9.6.1 hf4 version. can anyone suggest on this please? Thank you for update. From now onward I start to use this blog in my training practice. Thank you for explaining each step in screen shots. I use blogs for my easy reference which were quite useful to get started with. I am trying to install infomatica 9.0.1 +hotfix 2 on window 7 professional and getting the below error when installer is creating the domain. I pasted above error from C:\Informatica\9.0.1\Informatica_9.0.1_Services_HotFix2 logfile. Please let me know if I am missing any option or if you need any other information. I have created 3 entities from Provisioning tool (Person, Address ,Organisation) validated and published changes to MDM database.Now when I accessed on /cmx/csfiles on the browser, I got a list of services offered for that particular schema, and I imported the WSDL file into SOAP, I was able to see the <a href="https://medium.com/@infamdm02/mdm-tutorial-b3d750f5df3d> web services </a> for these entities. But the problem is there are many unwanted parameters in the SOAP request. My goal is to provide this WSDL to downstream systems and they are trying to access the web services through this WSDL but too many parameters which are unwanted . I mean that way these fields will restrict that entity to create any records(if filter enabled) . Isn't it?